I’ve been making more of an effort to bring food from home to work not only to save myself from eating junk but also to save some money. 2013 is no financial joke, you guys! Thankfully, I’ve added a few new items to my list of favorite portable foods. Okay. So. Stonyfield O’Soy yogurt is not vegan. I realized that their cultures are milk-based after buying it. Ugh. Kind of a buzzkill, but O’Soy yogurt is still a decent alternative to other yogurts (is it just me or does everyone else in the world eat Chobani yogurt?) and definitely more nutritious than donuts or cookies that I find myself eating when I’m starving for a snack. For an actual vegan yogurt that is super delicious, try Amande! Christie uses Amande in a breakfast parfait which you can read about here. I usually add some flax meal and/or granola to my yogurt. Speaking of granola, our friends at Cascadian Farm sent us a box of their new Berry Cobbler Granola. I love Cascadian Farm granola and go through it really quickly. I usually eat it as a cereal with some soy or almond milk and flax meal. It’s great with bananas or blueberries, too! Now, I wasn’t sure what to expect with the new Berry Cobbler flavor. How would it be different from other granola with cranberries or blueberries in it? 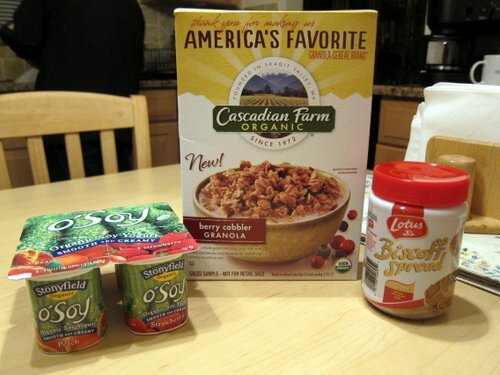 I don’t know how they did it, but Cascadian Farm concocted granola that actually tastes very much like berry cobbler!! So good and decadent that I find myself saving it for special days. Finally, I bought a jar of Biscoff Spread when I saw it for $3.99 at Fresh Farms. I find that it pops up in a lot of my Internet searches for Vegan treats or snacks, but I always felt that it was too expensive to even try, so I snagged it when I saw it for under $5. The spread is made with Biscoff cookies. Right on the jar, they call it out as an alternative to peanut butter. (I personally see it as a non-chocolate vegan alternative to Nutella.) It looks very much like peanut butter, has the same texture and is packaged like peanut butter, but it’s got that unmistakable Biscoff cookie taste. It’s so good on toast! It’s on the sweet side. I wouldn’t recommend eating it with jam or even eating it with fruit. My perspective has definitely changed on the cost: it’s no more expensive than almond butter or “fancy” peanut butter. If I’m feeling adventurous enough, I might try making Biscoff donuts. DELICIOUS!